Warning: This column contains explicit descriptions of bodily functions, medical procedures and talk of poop. It may offend some readers. Reader discretion is advised. You have been warned. As a bowel cancer patient, I’m allowed to talk about poop. The rest of you aren’t. It is still considered crass for you, especially over morning tea. But us ‘lucky’ members of the club, or ‘The Movement’ as I call it, are not only permitted; we are encouraged to open up and freely express our most intimate moments and results from every bombing raid over the oval office. It’s considered excellent bowelmanship to quickly and accurately describe a turd, and there are probably awards for the best orators on the subject of bowel motions. And there’s a curious thing happening here. It seems “poop” is less offensive than “poo”. Maybe a pee at the end makes it more socially acceptable. But I digress. Because number twos are our business. We’re the kings and queens of bodily waste functions. We and our medical buddies talk about them all day long. It’s the enthralling focus of every meeting, appointment and most afternoon teas. Would you like a slice of chocolate cake with that? We converse and tweet and even post on our social media poo portals, ShatChat and Faecebook. The colour of your cables is especially important to Dr Doodoo and the team. We’ve spent many happy mornings whiling away the hours in medical rooms, describing the exact colour, hue, texture and density of our fine products. I never thought dropping the kids off at the pool would send out so many ripples and make such a social splash. The colour description process has me developing this highly accurate colour identification tool. Yes, it’s a Stool Tool. 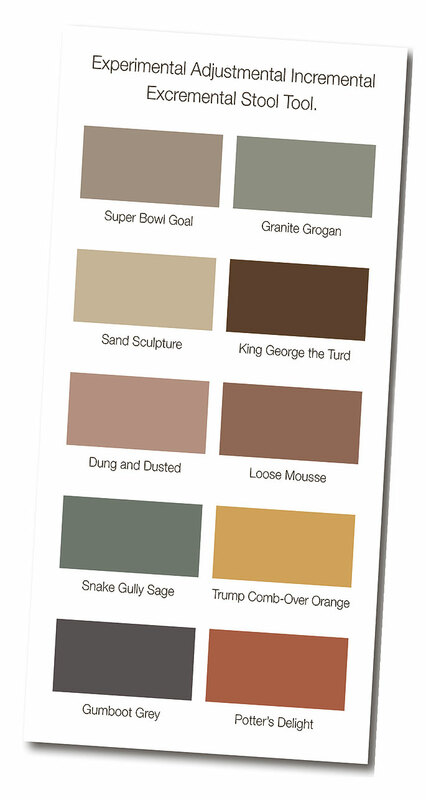 It works similar to a paint colour chart, to specify EXACTLY which shade of brown your plumbing system is experiencing. Just like British Paints, only a different can. It’s the world’s first Experimental Adjustmental Incremental Excremental Stool Tool. Using this chart, patients, nurses and doctors can pinpoint exact tones and shades; speed of delivery, scene of impact, degree of difficulty and artistic merit. If any readers have ignored the content warning at the start of this column, and are consequently offended by this content, tough sh**. Literally. Because raising awareness of the signs of bowel cancer is the most constructive thing I can do to potentially help others. I need all the readers I can maintain, so keeping you all alive is a high priority. I hope any of you, or your loved ones, who notice changes in their movements, particularly colour or any sign of bleeding or motions that are darker than usual, check it out immediately. Those of you with any family history are urged to get checked out. If something abnormal is found, my advice is don’t waste months on a waiting list for public colonoscopy or scans. Stump up the cash and get it done privately and fast. Sell the kids or the cat if you have to; waiting does not improve your chances of beating this thing. If you even have this thing. It might not even be a thing. But if it is, crack on with help and avoid Dr Google. Once you know what you’re dealing with, the public health system is pretty darned good at doing their job, but getting on the conveyor belt can be the first and biggest hurdle. I hope you never become members of The Movement, but if it happens, stay positive and box on. There’s a lot that can be fixed these days, medicine people and their procedures are getting better every day. Many thanks to the lovely medical teams at Tauranga Hospital who work relentlessly to keep me and my fellow Movement members as well as humanly possible. Be well, stay safe. Do NOT send me your photographs. Ah, it’s great to have another column in the can. Next week: Floaters versus Sinkers… What really happened in Archimedes’ bathtub?